Marc Marquez has lost a point in the overall championship standing due to his action’s in the Aragon race. He also lost all manufacturers points attained in that race. There is no doubt that Jorge Lorenzo feels that race direction made the correct decision, although he refused to comment at the press conference. Watch the video below to see Jorge’s feelings on the season to date and his opinion of the controversial overtaking maneuver performed by Marc on him. 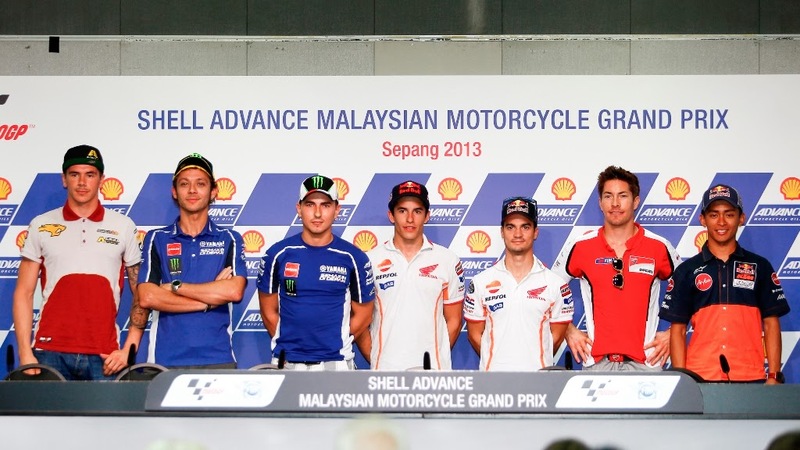 As the Shell Advance Malaysian Motorcycle Grand Prix in Sepang kicked off with the usual Thursday pre-race press conference with Repsol Honda Team duo Marc Marquez and Dani Pedrosa, Yamaha Factory Racing’s Jorge Lorenzo and Valentino Rossi, as well as Ducat Team’s Nicky Hayden, Marc VDS Racing Team’s Moto2™ leader Scott Redding and Red Bull KTM Ajo’s local Moto3™ talent Zulfahmi Khairuddin, all eyes were pealed on Repsol rider Marquez, who earlier in the day received one penalty point from Race Direction, and will be stripped of the Constructors Championship points for that race after his touch with Pedrosa in Aragon. Earlier in the day some of the riders took to some pre-race activity as NGM Mobile Forward Racing’s Mattia Pasini, PBM’s Michael Laverty, Team Calvo’s Maverick Viñales and Ana Carrasco, San Carlo Team Italia’s Romano Fenati, Maptaq SAG Zelos Team’s Marcel Schrotter, Red Bull KTM’s Arthur Sissis, his teammate Zulfahmi Khairuddin, Tech3’s Danny Kent, RW Racing GP’s Jasper Iwema, as well as GO&FUN Honda Gresini’s Niccolo Antonelli, took to the track’s Go-Karting venue, to sharpen up the race-craft before the serious business gets underway on Friday. Sissis took the victory ahead of Kent and Pasini. Parallel to this, the South East Asian Motorcycle Business Forum 2013 was also held today, to bring the main players from the motorcycle and racing industry together with key sponsors and figures in the Asian territory. Dorna CEO Carmelo Ezpeleta was joined by Repsol Honda Team Principle Livio Suppo, LCR Honda MotoGP Team CEO Lucio Cecchinello, as well as Shell Advance Motorcycle Oil Lubricant Global Brand Manager Koh Kar Tai, as they networked with many other key sponsors and local government representatives the day before the race.